Looking for a Mother’s Day Gift Journal or a new Mom Organizer Day Planner for next year? I’ve been a big fan of the day planners available from MomAgenda and I’ve just received word that their new 2011-2012 day planners are available. What I love about their products is not only their great attention to detail and thoroughness in the planners, but the great quality and design of all of their planners and journals. Definitely worth a look. Also, if you’ve been hunting for something nice for Mother’s Day, these cute journals might be just the thing. Beautiful colors, super soft texture and Mom inspired sayings on the front make these a great Mother’s Day gift. You can use the above momAgenda code until the end of the month for this or any other purchase on their website. And, until the end of April you can get a discount on your purchase. This questions from a new mom returning t o work arrived today. I wasn’t able to reply so I thought I would post her question. Although I don’t have a list – I will share with you MY SECRET for using my blackberry to keep organized. Are you ready ? It’s not about a Blackberry Mom application. It’s about using a service that offers EVERYthing you need on a remote server so you can access it from HOME WORK and your blackberry. If you are a busy working mom, busy stay at home mom, Busy work from home mom, you need to DUMP and simplify. To do this you head over to: http://www.Gmail.com and created yourself an email (then get RID of all the others – its a time waster. With your new Google account you can SYNC directly to your blackberry AND to your outlook (where you can also download your GMAIL email), organize your calenders, and have access to everything from your desktop, remotely from work, and on your blackberry. Invite others to share with you – colour label your kids, work, personal appointments, in google calender – share documents you create (google docs) – budget & track payments in google (excel), create a monthly grocery list ect. If you don’t have the time to ‘set it all up yourself. Check out Famundo -it’s $4.95 a month – but you have to sync to outlook then to your blackberry. Whereas Google will Sync Real time with your blackberry. So my Mom Blackberry keeping it all together trick is GOOGLE. It’s 2010 and I am happy to share all the mom planners and mom agenda’s available for quick purchase online. Today’s mom planner is more then a time management tool. The Mom Agenda Desktop runs through to December 2010 and offers monthly views at the front of the book, followed by a weekly view. I personally am a fan of a weekly view mom day planner. The 7″x9″x1″ size is not to big, but big enough to handle a busy family’s schedule. The planner can accommodate Mom calender needs and the busy schedule of up to four children. For those of you needing a mom planner or mom organizer that is a bit smaller. The Mom Agenda’s Daily planner is a great option. The planner only runs through to August (academic year) but it is already 40% off. The planner is 5″x7″x1″. Be sure to stop by The Mom Agenda Website and grab their free printable pages as well. 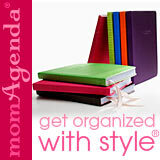 Click here for free mom mom planner pages, organizational tools, and printable holiday planner.